Become a musical interval expert! In this lesson you will learn the difference between a major and minor interval, and how to tell the difference between a perfect, augmented and diminished interval. Musical Intervals are measured in two steps. First by simply counting from one note to the next (the first note being 1). This is the "numerical" name of the interval. The second step is to determine exactly how large, or small an interval is. An interval of a third, for example can be either major or minor. With a little help from our friends the accidentals, it can become even bigger; called augmented, or smaller; called diminished. Whoa! Wait, don't freak out! There are tricks that you will learn here. But first things first. If you don't already know how to quickly identify the interval with its number value ( Unison, 2nd, 3rd, 4th, etc.) I recommend you go to this lesson first. Come back here when you're done. The easiest way to learn about the different sizes, called quality, of musical intervals is to use the major scale as a template. In this C major scale, if you start from C and measure it against one note at a time from the scale, the intervals will all be either Major, or Perfect. and C-C is a Perfect Octave. Using the major scale (any major scale) is a great tool as a way to remember exactly how large a Major or a Perfect interval is, so you don't have to memorize exactly how many semitones and tones apart each interval quality is. Simply use the C major scale as your "ruler" and compare. For example, C-D is an example of a Major second. How large exactly? 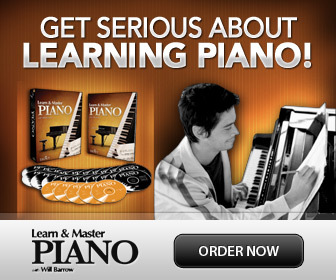 A whole step (or two halfsteps/semitones). So all major seconds are a whole step (whole tone) apart. From C to itself (!) the interval is called a Prime or Unison. It's a Perfect Unison. From C to D is the interval of a 2nd. Since this 2nd is a whole tone apart; it is called a Major 2nd. From C to E is a Major 3rd. Two whole tones apart. C to F is a Perfect 4th. 2 1/2 tones apart. C to G is a Perfect 5th. 3 1/2 tones apart. C to A is a Major 6th. 4 1/2 tones apart. C to B is a Major 7th. 5 1/2 tones apart. C to C is a Perfect Octave. 6 tones apart. So this was the "base-line". Now we have something to compare with! As we saw; 2nds, 3rds, 6ths and 7ths are called Major intervals when you use the exact distance of whole and half tones from the major scale as we did above. So, you can just refer to the major scale when you want to know exactly how many tones and semitones apart each Major interval is. We also learned that the 4th, 5th and Octave are called Perfect when we use the "major scale method". A Unison (from one note to the same note) is also a Perfect interval. The next method to learn the different intervals and their qualities is to look at the notes on a musical staff. On the piano keyboard we can see the pattern of all the 12 pitches in the Western musical notation. All the keys are exactly a semi tone (half step) apart. If we look at only the white keys, we have the note names of the 7 basic notes: A B C D E F G.
You'll notice that between these basic or "white" notes, not all intervals are the same, (not all have a black key between them). This is important to remember! All basic notes are a whole tone apart except between E-F and B-C!!! Memorized that? OK. Let's look at the musical staff and the notes on it. All notes are a whole tone apart...except between E-F and B-C- also here of course! On a music staff all notes look as if they are the same distance apart....but now you know they aren't. So, quickly learn to find those semi tones and remember where they hide; between E-F and B-C.
On the musical staff, (Please observe that we're not using any sharps or flats yet!) you will find also Minor, Diminished and Augmented intervals. For example from B-D there is a 3rd, but it is only 1 and 1/2 semitone apart. This is called a Minor 3rd. By comparing with the size of a Major 3rd in the major scale method above which is 2 whole tones/steps. And from E-F there is a 2nd, but it's tiny. Only a semitone, so it's called a Minor 2nd. There is also a weird musical interval of a 4th, between F and B. It is called a Augmented 4th because it's a semitone bigger than a Perfect 4th. And check out the 5th between B and F. It is a semitone smaller than a Perfect 5th, so it is called a Diminished 5th. Both these intervals are exactly 3 whole tones apart. They are also called "tritone" intervals. OK. So let's summarize what we've seen so far. 2nds, 3rds, 6ths and 7ths. These can be either Major (big) or Minor (small). Unison, 4ths, 5ths and Octaves. They are called Perfect. 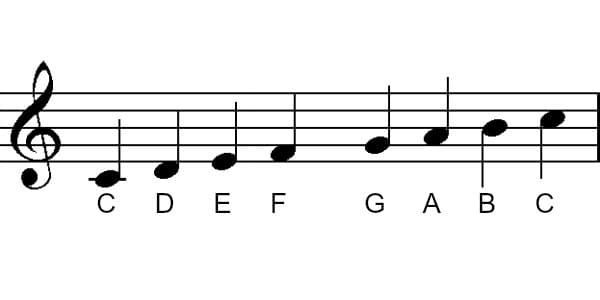 The only exception are the two intervals between F-B, and B-F where there is a "bigger" 4th, called Augmented, and a "smaller" 5th, called Diminished. Now the fun bit! Each musical interval can of course also be altered using sharps and flats, also called accidentals! When adding accidentals a musical interval can become even larger/smaller. As we saw above; using only "white notes", all are Perfect, except between F-B and B-F. These two intervals are also called "tritone", since they are exactly 3 tones apart! They are also "enharmonic" (sounding the same) even though one is a 4th (Augmented) and the other a 5th (Diminished). Adding accidentals we can make these intervals larger or smaller as well.